In the small village of Saini in India, Baby Lali silently sleeps as dozens of people watch her, touch her, and dance at her feet. 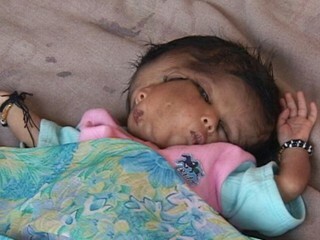 The tiny infant was born with a rare condition called craniofacial duplication where a single head has two faces. Except for her ears, her facial features are duplicates on either side. She drinks milk from both mouths and both sets of eyes blink and close. After leaving the hospital in the suburbs of Delhi, Baby Lali was swarmed by villagers. They believe she is the reincarnation of the Hindu Goddess, Ganesh. People from all corners of India flock to Saini to revere the extraordinary child, some even offering her parents money believing the baby to be divine. In Saini, there are no toilets, no electricity, and no technology. The average income in the small village is $2 a day. Tens of millions of pregnant women in India do not receive any form of pre-natal care. Although Baby Lali is doing fine, according to the local doctor, her true condition is still uncertain. It is a rare condition of conjoined twins. You’re right that Baby Lali is similar to the baby with extra arms and legs. It is freaky that the similar condition happened to India. But I believe that it may be because of the social and economic conditions in India. Poverty is rampant in India that most pregnant women do not get enough nutrition which may result in twins not splitting properly. I can’t begin to imagine what kind of life Baby Lali will be facing in the future.